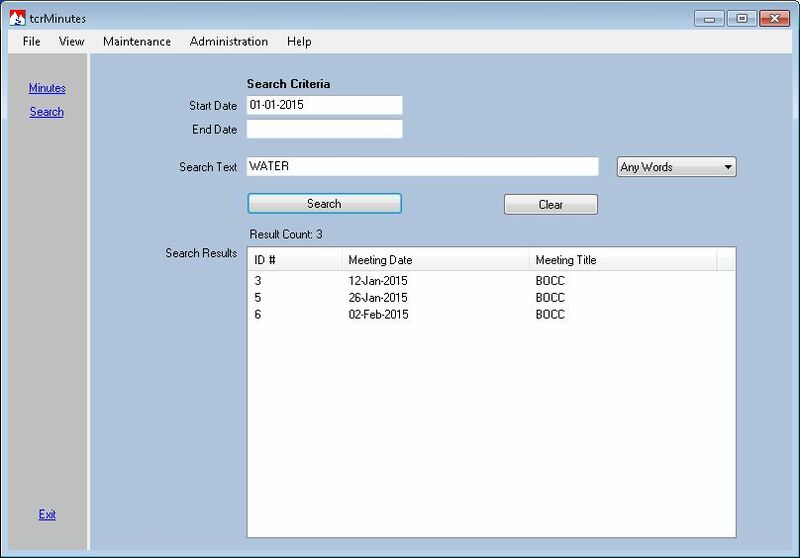 tcrMinutes is used to maintain, archive and search meeting minutes. Minutes can be for any meeting type; Board of County Commissioners, Board of Supervisors, Health Services, School Board, Budget working group, Executive Session are a few examples. Click image to view tcrMinutes Picture Gallery. The two key features of tcrMinutes are the secure and permanent archive of meeting minutes and its ability to search the minutes archive. tcrMinutes stores your meeting minutes in Word .docx format in a secure location. When the minutes are marked approved file permissions are set read-only so that accidental changes are not possible. The result is a secure archival of your meeting minutes. Minutes text is automatically extracted for searching, no indexing is necessary. Words and phrases of meeting minutes are quickly searched returning a list of meetings containing the search criteria. Double click a meeting and a read-only copy of the minutes will be opened in Word with each search word color highlighted for quick location. 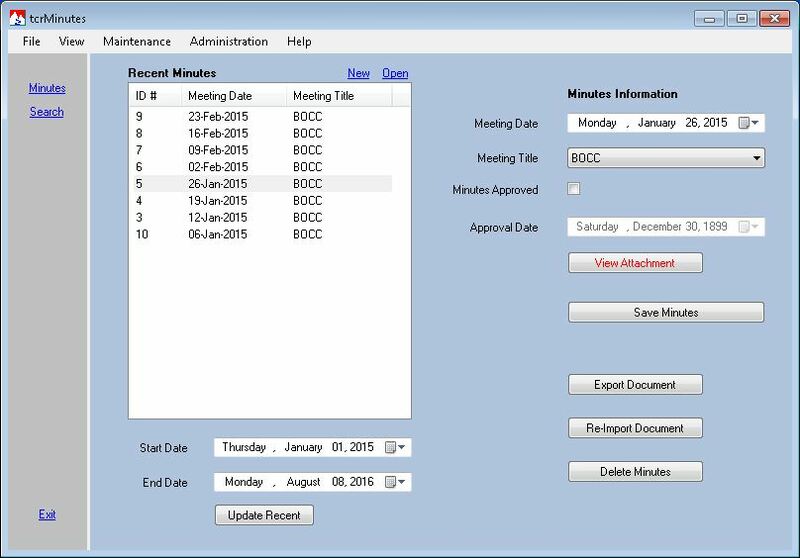 tcrMinutes is integrated with Microsoft Word to create and maintain meeting minutes. 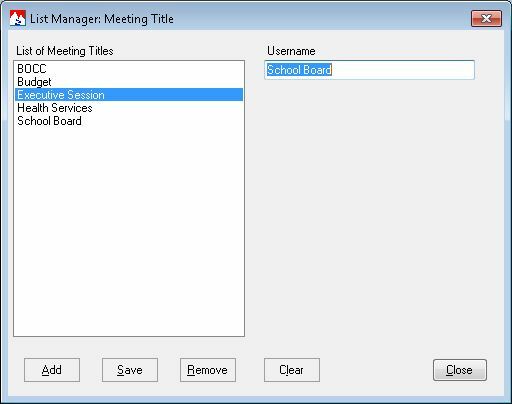 New meeting records can be initiated within tcrMinutes or created off-line on a different computer. tcrMinutes supports use of a Template that contains boiler-plate information for consistent document structure of each minutes record. Minutes created off-line can easily be imported into tcrMinutes for archival and searching. Meeting handouts can be scanned into tcrMinutes for archival and later review. An image viewer is built into tcrMinutes supporting easy visual access to these records. Meeting minutes can be exported to Word .docx files or to html files for use on web sites. tcrMinutes is bundled with our recording system, theCountyRecorder, at no additional cost. If you are not a recording system customer you can purchase tcrMinutes as a stand-alone product, please see our Price Sheet (PDF) for details.